This is my first time reviewing works outside of a writing group format. I did not want to post anything that would count as spoilers, but given that I am reviewing a trilogy here all at once, that was tricky to do. 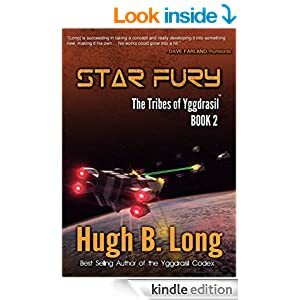 Hopefully my reviewing style will improve as I go along, but in short, I highly recommend these fun Space Opera novels and eagerly await Hugh B. Long's follow ons. Hugh B. 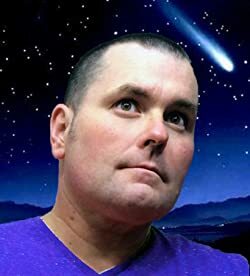 Long is a fellow independent author of Space Opera and Fantasy with a decidedly Nordic flavor. 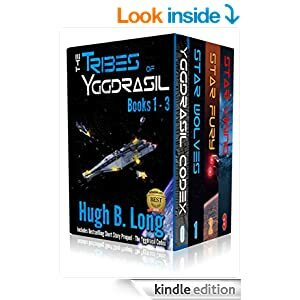 The Tribes of Yggdrasil is Long's ongoing Space Opera taking place in a universe where the Norse Gods were real, or at least very ancient and powerful aliens. This adds an interesting flavor to the story arcs as most "Ancient Alien" sci-fi focuses more on African cultures, and especially on the Egyptians. 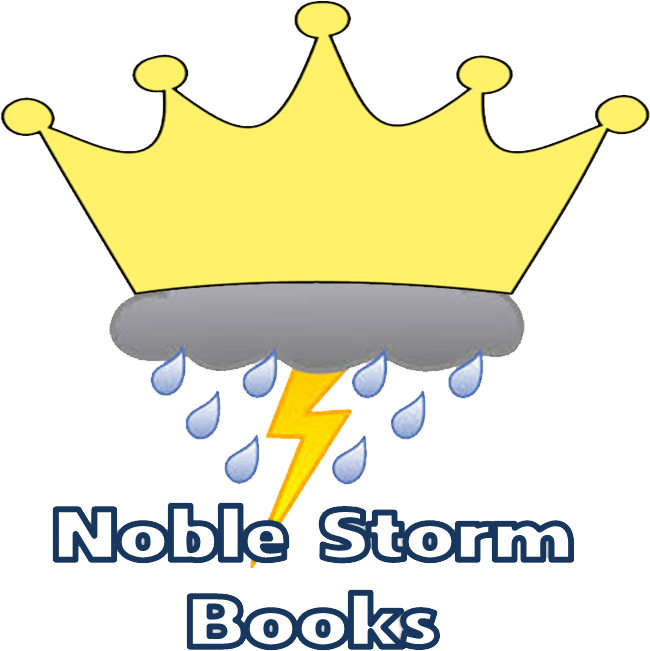 The First Trilogy focuses primarily on Haldor Olsen and his crew as they battle against the Hrymar threat encroaching on the expanding human empire. First released in May 2012 is a 15 page short story that serves as a prologue to The Tribes of Yggdrasil Trilogy. The book follows two young up and coming scientists, one an expert in Runology, and the other Astronomy, as they make a startling discovery about an ancient Norse Runestone. The discovery has vast implications for all of mankind as it proves, once and for all, that we are not alone, and that ancient aliens have taken an interest in us before. The story may sound a little familiar, and at first I thought so as well. But it is handled in a way that most stories like this don't do. Instead of the rune stone containing some mystical device that transports humanity across the stars after deciphering what amounts to little more than a child't riddle, it contains instructions for further communications and requires the most advanced computers on the planet to unlock all of it's secrets. I did enjoy the possibly unintentional nod to HP Lovecraft in that it was the coming together of two different specialists in vastly different fields that pointed to the rune stone being more than just an archaeological curiosity. Overall this was an enjoyable read and sets the tone well for the rest of the series, grounding the story in hard science and a mythology not often seen in speculative fiction. 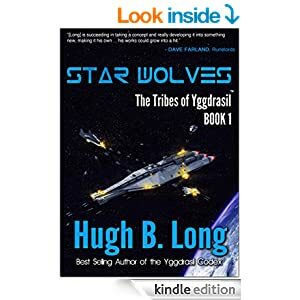 Released in December 2012, Star Wolves takes place approximately 100 years after the events in The Yggdrasil Codex. 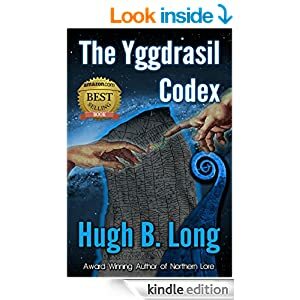 It follows the exploits of Haldor Olsen, Hal, the descendant of the runeologist who decoded the rune stone and helped humanity make first contact with its cousin race, the Alfar. Much has changed in the intervening 100 years, the world has come under the common rule of the Solar Inclusive Democracy, (SID) a true democracy where everyone has an equal vote. Humanity has also expanded beyond Earth, throughout the solar system and beyond, establishing the first extrasolar colony of New Midgard. Ancient religions have risen to new prominence, with the old "pagan" religions all but replacing Judo-Christianity for many people. Haldor serves in the SID's explorer fleet, charting new planets and finding those that might make acceptable colony sites. After returning home to his wife and son on New Midgard he is told of a planet with another rune stone on it and is sent to the Alfar homeworld to charter a mission to investigate. The six month mission reveals that certain runestones allow access to a vast "interstellar bridge network" allowing ships to travel much faster than they can in hyperspace. While Hal is away however the Hrymar, another cousin race to humanity, attack New Midgard, kidnapping most of the populace to use as slaves before destroying the colony. This action forces the SID and the Alfar to have to deal with the Hrymar, and they commission Hal and his new crew to chase them down in his new ship, the Sleipnir, a new class of Stealth Corvette. This book again is very enjoyable read. The science in it tends to be solid and consistent. FTL communication can only occur between planets of sufficient mass and that have a specialized piece of equipment that uses quantum entanglement. The use of FTL ships, a trope of Space Opera, is well handled with hyperspace, but tends towards the Trek or Star Wars model, where ships can enter and exit hyperspace at will. Combat is executed exclusively in normal space and is well done, with battles taking place once ships are within a few light seconds of each other, and chases taking hours to accomplish because of the vast distances. Hal serves as an interesting main character and a good windows into this universe as he make discoveries, endures losses, and triumphs through victories. The personal and personnel challenges he faces are all too familiar and feel real. His interactions with Devrim, the son of the Hrymar Over-Chieftain are well handled and interesting. My biggest nit with the book is that most of the races tend towards human cousins. They are very similar to humans, varying only by height, build and skin coloration. More diverse races show up towards the end of the book, but with exception of Humans and Alfar most tend to be limited in their cultural depth. The Solar Inclusive Democracy (SID) hangs by a thread after the devastating Hrymar attack on Earth. Millions are dead and the rest are reeling with backroom politicking threatening to tear the government apart. Things are no better for Haldor Olsen, Hal, captain of the Sleipnir, as he tries to recover from not only the loss of his family but the betrayal from one of his oldest friends. Hal doesn't sit idle though, and after receiving an urgent mission from the SID president races off to chase down Earth's richest man. This man betrayed the Earth to the Hrymar, selling them secrets and technology in exchange for subjects to conduct horrific experiments on so that he might extend his own life. Meanwhile, Devrim, the new leader of the Hrymar begins his own quest to make his people a true superpower, consolidating their leadership and begins to turn a young human slave boy towards the Hrymar way. Released June 2014, Star Fury is an excellent follow up to Star Wolves. It does everything a good sequel should, it expands the universe, telling a larger story that ups the ante for everyone. The book delves into the dark side of the otherwise Utopian SID, showing that no matter how noble the goals, human greed will not be so easily overcome. The expansion of the universe is great, with new places and non-human races introduced as well as new characters. I particularly enjoyed this aspect of the book as well as Hal's wrestling with the loss of his family while trying to serve a changing government that no longer stands for what it once did. I quite enjoyed the way that Long developed the Hrymar in this book, using the human slave to illustrate many parts of their culture. We really feel the terror the child endures as he is forced to live amongst Hrymar children. I just feel that his eventual transformation needed one more scene to really clinch it in my own mind. I really want to see more of these diverse aliens as the series progresses, especially the mysterious blues. I hope they will play a much larger role as the series progresses. 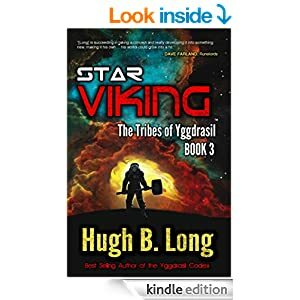 Released December 2014, Star Viking takes place ten years after the events of the previous two books. Haldor "Hal" Olsen has broken away from the SID and the Alfar to form his own feudal government. His major goal, to end the Hrymar threat. For nine years he succeeds in doing just that, pushing the Hrymar back before Devrim, the Hyrmar Over Chieftain deploys his new line of ships that begin to decimate every colony they come across. To complicate matters more the lead ship of the fleet is commanded by one of the fiercest Hrymar ever, and his protoge' Hal Olsen's own son. I like the progression here in the books. Hal has risen to a role of supreme leadership over his people, bringing in recruits from a variety of races to battle against the Hrymar. The Technology has grown as well, developing from the seeds planted in the early books. The immobility of command even begins to come into play as Hal is forced to watch others fight on his behalf, something he would much rather do himself. When he does leave his ship to lead the troops, it is something that his crew fights against, a good touch. 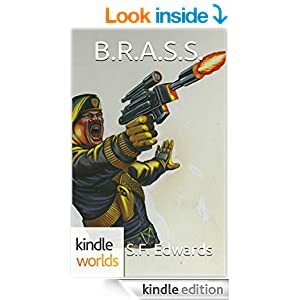 As a character Hal grows a great deal in this book, his relationship with a freed slave girl opens up doors he thought long closed as he takes her as his own daughter and in the process discovers and awakening power within both of them and my favorite character, his alien Dire Wold Venn. His personal relationships also continue to flourish, but face road blocks when he learns that his son is not only alive, but wants him dead, and leaves him questioning whether his wife might also still be alive. Long continues to plant seeds in this book of things to come. Betrayals by certain characters are explained, but others left to hang enticing the reader to find out what will happen next. Long is building up to some massive, galaxy shattering events in these books with new players coming on the scene and preparing to move in for the kill.